"Without inventing anything, the Swedes skillfully bring the AOR of the 80s up to date and revive some of the cult formations of that time." In 2014, the members of State Of Salazar embarked us in their DeLorean for a return in the 80s with an "All The Way" with a scent worthy of the best opuses of Survivor or Toto, to name a few. Four years later, the Swedes are back with a slightly modified line-up, with keyboardist Stefan Marteson having left the quintet to be replaced by Kevin Hosford. This change is important, as the newcomer adds singing and composition to his interventions behind his keyboards. Still supported by the label Frontiers and accompanied by Alessandro Del Vecchio in the production, Marcus Nygren's gang took its time to follow up on his promising first opus, allowing real evolutions in his music to be considered. Evolutions, however, are rare in this "Superhero", which does not prevent the Scandinavian combo from offering a new and succulent series of energetic and melodic tracks. Again, it's hard not to think of Survivor when listening to the single 'If You Wait For Me' or 'Hold On Tonight'. The choruses are catchy and the riffs too, all sprinkled with deliciously kitsch keyboards with a production that perfectly meets current criteria. Marcus Nygren's voice is still a perfect blend of Toby Hitchcock and Bobby Kimball's (Toto) vocal organs, and Steve Lukather's formation is already a landmark on "All The Way", so it is not surprising to find its influence on "My Heart Is At War" or on the monumental "Masquerade". The latter is the occasion for a beautiful instrumental demonstration by Johan Thuresson and Kevon Hosford. Slightly syncopated and endowed with a phrasing typical of the legendary Los Angeles band, "Someone I Know" also makes a very good impression. 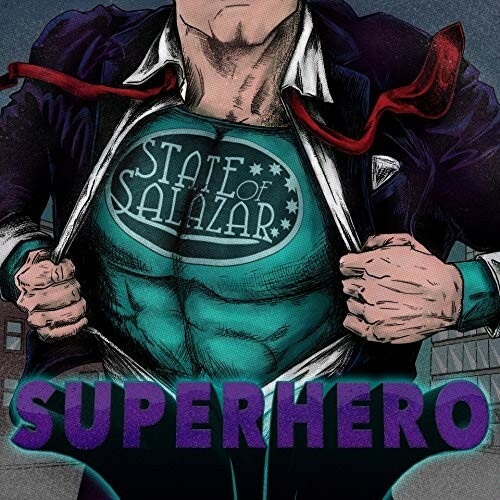 But where the main evolution in State Of Salazar's music lies is when the keyboard player gets into the microphone to share the vocals with Nygren for a result that is irresistibly reminiscent of Pride Of Lion, especially since his voice is not unlike that of Jim Peterik. 'She's A Loaded Gun' and the eponymous title are the best examples of this with a beautiful energy and choruses that are always unstoppable. However, the question arises of the interest of depriving oneself at times of the frontman's vocals, which is better than that of the newcomer. A track like 'To The Wire' is not lacking in quality, but it would probably have been better to have been played by Marcus Nygren rather than Kevin Hosford in its entirety. "Superhero" leaves thus the listener shared. On the one hand, the Swedes do not invent anything and recycle ingredients that have been used many times over. But at the same time, they do so with such talent, communicative energy and obvious authenticity that it is difficult to resist them. However, it would be interesting to see what their formula could look like if they incorporated some more personal elements. In the meantime, all the orphans of the cult groups of the AOR of the 80s have to throw themselves on this album which will satisfy their appetite for thirty-year-old melodies.